To mark the centenary year of the start of the First World War I’m going to be showcasing some of the records related to artists throughout the conflict. 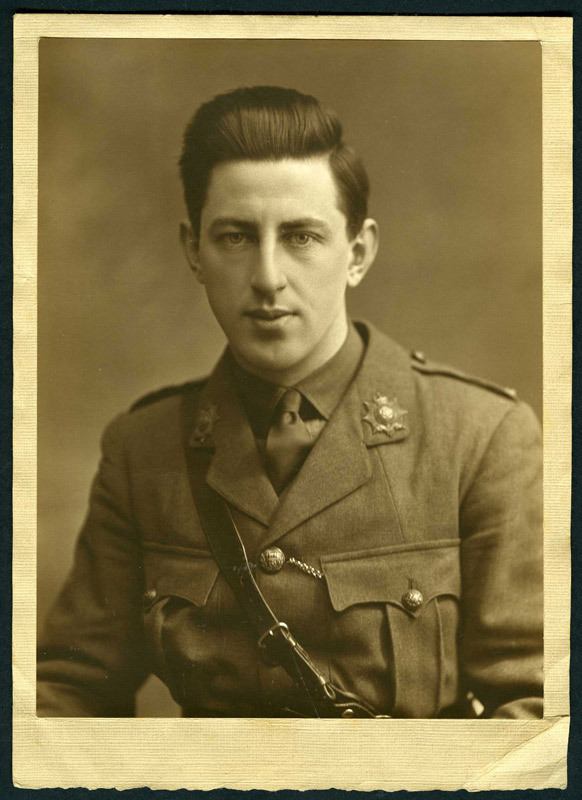 In the first of my posts I’m going to look at Paul Nash, who became a notable war artist during the First World War. 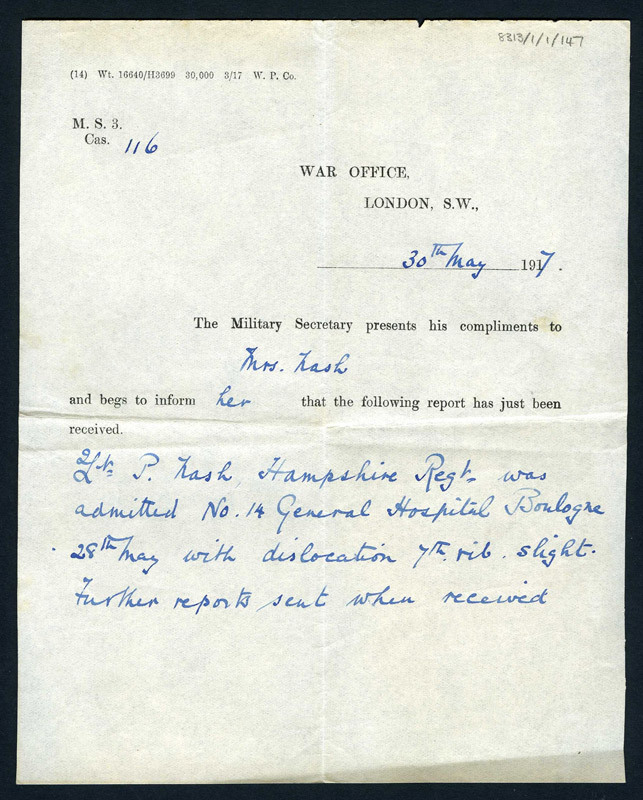 Tate Archive holds letters sent from Paul Nash to his family and wife, Margaret, during the war. 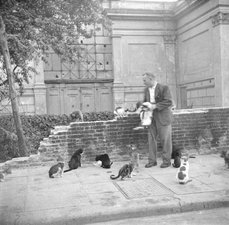 After attending the Slade School from 1910–1911 Nash was making a modest income from his art when the First World War broke out. Following his enrolment, Nash was stationed in barracks in England during 1915–1916. It wasn’t until February 1917 that he made his first trip to the front line as a Second Lieutenant in the Fifteenth Battalion of the Hampshire Regiment. His letters, some of which are illustrated, describe life in the trenches and his disillusionment with war. Though Nash survived the war it wasn’t without injury and in May 1917 he fell and broke a rib which led to a long spell in hospital in England. Among Nash’s letter is the notification of his injuries addressed to his wife, Margaret. 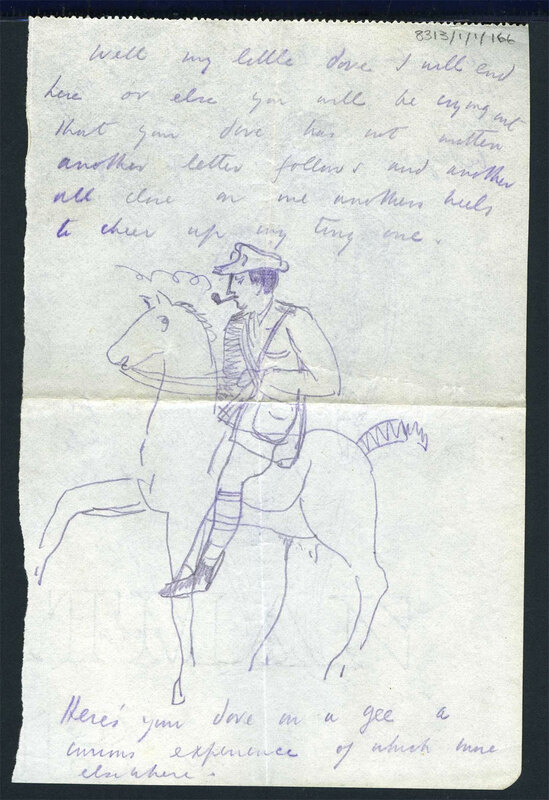 Nash’s letters also show that he was drawing throughout his time on the front line and mentions drawings he was working on and exhibitions he was organising. Following his injury, Nash held his successful wartime exhibition Ypres Salient at Goupil Gallery in 1917. The exhibition, along with testimonials from his contemporaries addressed to John Buchan, the Director of Information, led to Nash’s appointment as a war artist. Tate Archive holds a number of letters from artists and writers, including Henry Tonks, Roger Fry and Frank Rutter, highlighting Nash’s suitability as a war artist. When Nash returned to the conflict in late 1917 it was to record the war with his art. In his letters there is an overwhelming sense of Nash’s fascination with the landscapes and nature around him which he describes at length and is reflected in his art at this time. Much of Nash’s art depicting war-torn landscapes from this period is in the Imperial War Museum collection. 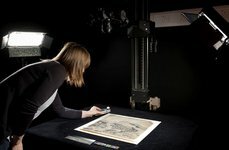 The role of the war artist was to record the war, both from the front line and the home front, for documentation and propaganda purposes. I am no longer an artist interested [and] curious. I am a messenger who will bring back word from men fighting to those who want the war to last forever. Feeble, inarticulate will be my message but it will have a bitter truth and may it burn their lousy souls. Paul Nash is just one of 52 artists included in the Archives & Access project. 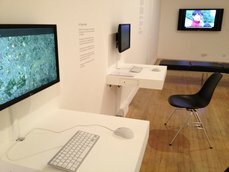 In Autumn 2014, 52,000 pieces from Tate’s archive will be accessible online through the Art & Artists section of our website.